349 pages | 93 B/W Illus. Introducton. Asset Management. History of RCM and its relevance in today's industry. 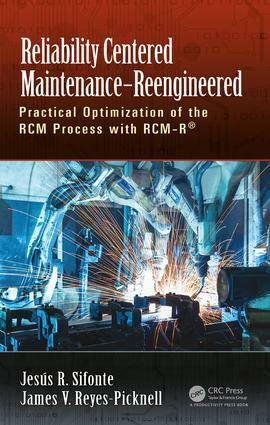 The RCM-R Process. RCM-R Pre-Work. Functional Analysis. Failure Symptoms and Causes. Quantifying Failures Impact. Overview of Maintenance Strategies. Condition Base Maintenance Techniques. Selecting Machine Strategies. RCM Fine Tuning. RCM Implementation and Summary of Benefits. Appendix 1: Maintenance Terminology Glossary. Appendix 2: Maintenance Management. Appendix 3: Other RCM Methodologies. Index. Jesús R. Sifonte, BSME, MMRE, PE, CMRP is the founder and President of PdMtech of Vega Baja, Puerto Rico, United States if America. He provides business consulting services in the areas of Condition Based Maintenance techniques certification and implementation, RCM and reliability analysis teaching, mentoring and implementation. He is also the director of Puerto Rico’s based Condition Monitoring and Maintenance Institute with presence all over Latin America and Spain. He is a licensed Professional Engineer, a certified level III ASNT-TC-1A vibration analysis consultant by Technical Associates of Charlotte, Member of the institute of Asset Management, the American Society of Mechanical Engineers, a Certified Maintenance and Reliability Professional by the Society of Maintenance and Reliability Professionals (USA). Jesus holds a Bachelor Degree in Mechanical Engineering from the University of Puerto Rico and a Master of Maintenance and Reliability Engineering Degree from Monash University at Australia. Jesus has extensive years of hands-on experience in engineering, maintenance management, predictive maintenance, reliability engineering field practice, implementation and consulting. James V Reyes-Picknell, BASc, CMC., P.Eng., CMRP, CAMA., is the founder and President of Conscious Asset, a Canadian-based consulting and training firm specializing in asset management. He provides business consulting services for our practice in Physical Asset Management in the areas of strategy, process improvement, executive / management coaching, change management and general client advisory. He is a licensed Professional Engineer, certified management consultant (international), certified maintenance and reliability professional (USA),a former RCM2 practitioner, member of the institute of Asset Management and honours graduate of the University of Toronto in Mechanical Engineering. James also studied at the Royal Naval Engineering College in the UK, the Technical University of Nova Scotia and at Dalhousie Universities in Canada. James has extensive years of hands-on experience in engineering, operations, maintenance management, consulting and change management.